Glass Pieces: This Jerome Robbins ballet, set to three Philip Glass pieces, thrills every time. The last movement pushes you to the brink in its intensity. Just when I'm on the edge, when I feel the relentless pace is about to overwhelm me—then it concludes. The pas de deux (Sara Mearns and Adrian Danchig-Waring) is so good, with their bodies exploring the tension in the space and the music. Mearns's muscular body is perfect for this, and Danchig-Waring proves as equal partner. The first movement is a great start, a way to temper the audience for what's ahead, the order in the ceaseless chaos. Thou Swell: I adore this celebration of the Richard Rodgers catalogue. (The Peter Martins ballet uses both Rodgers + Hart and Rodgers and Hammerstein songs; Leah Horowitz and Joseph Eletto were the featured vocalists.) Thou Swell is such a lovely, sumptuous ballet. 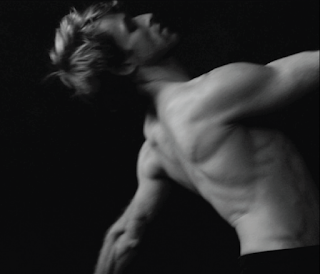 It's the kind of dance piece that is Sterling Hyltin and Robert Fairchild's bread and butter. In particular, you can see how Fairchild's jazz background comes in handy, and makes him so well-suited to this. He and Hyltin have an exciting jazz section, and they're on fire. Such technique paired with such flair, flair and joy that's missing from Ask la Cour (who's paired with Teresa Reichlen). He is hitting his marks, but he's stiff. He allows me to see the effort instead of seeing the fun and exuberance. The great Amar Ramasar has the flair, the swing, though. He dances as if he's flirting with the whole audience. Perfect for this ballet set in a supper club. His jazzy section with Rebecca Krohn is a delight. Jared Angle and Sara Mearns have the least jazzy but most emotional section, and it's a great fit for the frequent on-stage pair. And I love the way the women work their Peter Copping costumes, enhancing the spins and swirls. It's really fun. Stars and Stripes: Is there a more American ballet? Featuring Hershey Kay's arrangements and orchestrations of the classic John Philip Sousa music, this is George Balanchine's homage to American pomp and circumstance. Erica Pereira, Savannah Lowery, and Daniel Ulbricht led the first, second, and third campaigns (respectively), and then the buoyant Megan Fairchild and Tyler Angle delighted as Liberty Bell and El Capitan. I firmly believe this should be performance and broadcast every Fourth of July. What a fun way to end of afternoon of American music.